La Plagne, made up of six high altitude resorts (Aime la Plagne, Belle Plagne, Plagne Villages / Soleil, Plagne Bellecôte Plagne Centre and Plagne 1800) which are linked from 8am to midnight, allowing for a car-free holiday. Four other villages also link into the ski area (Champagny en Vanoise, La Plagne Montalbert, Montchavin and Les Coches). 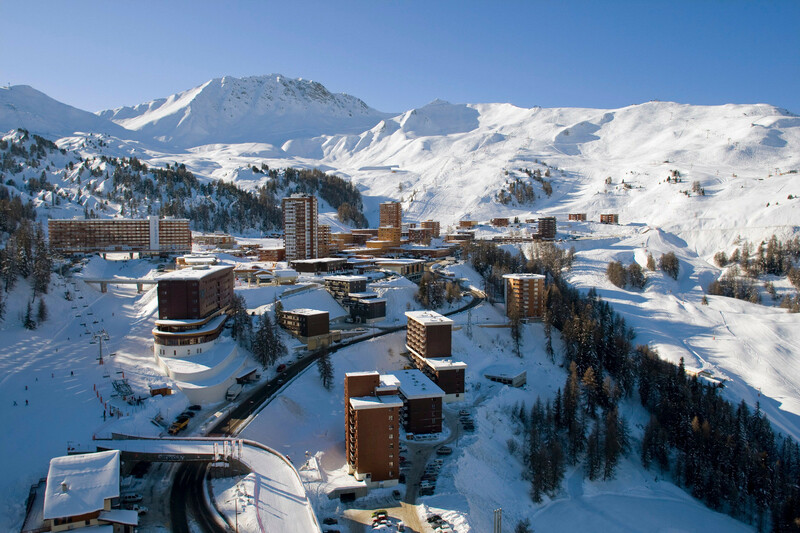 La Plagne is a ski resort at the heart of the Paradiski area. This ski paradise (Ski area with of 425 kilometres of ski runs) is huge and offers amazing diverse skiing. You can discover a wide range of villages, each with its own personal character or switch from snowpark to glacier or forests to wide open ski runs from one minute to the next. Within the ski area there are five boarder cross courses. A true marvel for Ski/Snow-cross enthusiasts, the Paradiski team has gone out of its way to build these great fully equipped, specially built areas. For those who are just learning or prefer easier skiing you can get over the Serenity area, which is specially set aside for you. Overlooking the Mont Blanc and Beaufortain Massif, La Plagne has guaranteed snow and a great atmosphere to match (nightclubs, bars, bowling, live concerts, happy hour ...). Along with that there is a range of activities on offer; snowmobiling, bobsleigh, ice skating, paragliding or 7cube - a 900 metre long snow park, fully dedicated to freestyle. Throughout the recent winters, La Plagne has improved its activity range for non-skiers. There are beginner craft groups, guided tours, snowshoe trails and walking trails all on offer. La Plagne also boasts an Olympic bobsleigh track, a climbing wall and natural waterfalls for climbers. There is also a stadium (Stade de Slalom Jean-Luc Cretier) to watch ski slalom. These huge range of activities show why La Plagne is such a popular resort year on year.